A guaranteed hit amongst all guests, an ice-cream machine is most definitely the product to have. With the built in ability to serve banana, chocolate and everyone’s classic favourite vanilla your guests will be begging you to host again. Great for any occasion or event. At only $250 for a single machine or $500 for the double delivered to most suburbs free and with only top quality ice cream mix for 100 people or 200 for the double plus extra mix if you need. We also supply 100 single cones or 200 for the double machine. All machines are cleaned and sterilized before delivery. Due to the weight of the machine we are unable to go up stairs. Ice-cream Flavours: Vanilla, Chocolate Yogurt Flavours: Vanilla, Banana and Chocolate. 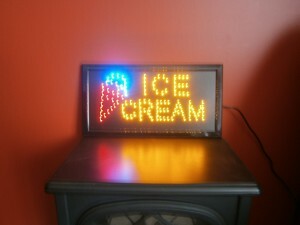 A Free LED Flashing Ice Cream Sign With Every Hire.